Whether you’re a seasoned auditioner or it’s your first time, there is always a chance that you may not get chosen for the role. So remember, every casting that you attend will help with confidence for the next one. Try not to get disheartened about these processes, chalk it all up to experience! In a previous post, ‘First Casting Jitters’ we guided you through overcoming nerves for your first casting. We want to recap on the most important tips regarding a casting and appropriate clothing, whether it’s your first or not! 1. Bright colours – Bright colours are a must. 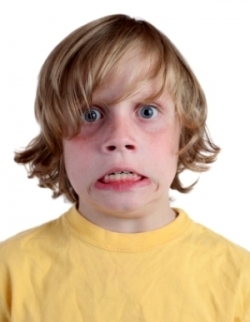 Most casting agencies will want to take a photo of your child against a white wall. You want the photo to stand out, not blend in! 2. Clean shoes – Never underestimate the importance of clean shoes! Simply giving them a quick scrub over or wipe before a casting makes all the difference in your child’s overall presentation… and it only takes a few minutes! 3. Brand appropriate – Think of the brand you are going to cast for (if known) and try to dress your child in similar attire depending on the genre, e.g. sporty, high fashion, casual, professional. This will give the client a clearer image of what your child would look like in the campaign or advertisement. 4. Age appropriate – It is essential to ensure your child is dressed to an age appropriate standard. This means no inappropriate language on clothing and for girls 14 and under: no make-up, excessive jewellery or high heels. Clients always want talent to be natural. 5. Comfort – Don’t dress your child in anything that they may feel uncomfortable wearing, this will minimise their ability to speak easily and they may not feel relaxed during the casting. 6. School Uniform – Many castings occur after school hours, but we encourage parents to take a spare outfit to put on before the casting. There can be occasions where children are required to wear school uniform, generally if the casting is for a Government or School campaign – however you will be notified by us if this is necessary. Put simply, if we don’t mention anything about school uniform – don’t wear it! We are generally given very little notice for castings/auditions. Clients will usually request talent to come in the next day or even the same day! If your child is selected by a client for a casting, we will be in contact straight away. Please be sure to respond as soon as you can, we often require confirmation by the end of the day. We will EMAIL you with all of the details of the casting including what the campaign is for, what role they are auditioning for as well as the date, time, location and any additional requirements such as wardrobe or scripts. Please be sure to read all details and attachments carefully before confirming whether your child will be attending the casting. It is particularly important to check ALL dates for the casting/audition, callbacks, wardrobe fittings and shoot to make sure your child will be available if they progress to the next stage. We will follow up with a TEXT MESSAGE straight away to prompt you to check your email. Please check your email and respond back to let us know whether or not your child will be attending. If we don’t hear from you, we will follow up with ONE MORE TEXT MESSAGE and/or a PHONE CALL. We must inform the client whether or not the requested talent will be attending, so please reply either way. Even if you can’t attend. Our Castings Department have dedicated text message phone numbers so be sure to save them in your phone so you can easily identify when we are trying to get in touch with you. *Please note these numbers are a web-sms service so cannot receive calls, please only use them to reply to casting requests. Any other enquiries must be directed to the general agency phone number 1300 888 611. Our castings department is an extremely busy place so it is important to keep communication streamlined. Please treat all casting correspondence with a sense of urgency. We need to get back to the client as soon as possible with the confirmed talent. If we do not hear back from you within the required time frame we will have to let the client know you are unavailable. Unless we hear back from you within the required timeframe we will have to let the client know you are unavailable. Generally, casting times are not flexible but if you are unable to make the requested time please let us know ASAP and we will contact the client to see if a time change is possible. Please note that the date of the casting cannot be changed. It is your responsibility to ensure that you read all relevant information about the casting – the email casting notification contains all the information you need for your casting. We coordinate hundreds of castings every month so we know exactly what you need to know and provide all of this to you upfront. If you haven’t received the casting notification email for any reason, it is your responsibility to let us know. It is also not a plausible excuse if you fail to attend the casting based on the premise that you didn’t receive the details. If you cannot make a casting due to illness/ changed circumstances you will need to let us know immediately. Your child will not be penalised for this as we understand these things happen, but it is best if we can let the client know ASAP in case they would like to see another talent in their place. Make sure you take note of any wardrobe requirements if there is nothing specific then neat/casual clothes is perfect. Please refresh your memory with our blog post on First Casting Jitters to help with preparation once your casting has been confirmed! You can also read the Castings Guide attached to your casting notification email and watch our Youtube videos for more tips and tricks. We have looked at what happens before a casting, now let’s look at what happens during the casting. ‘Punctuality is key. You have to be careful not to be too early, but you most certainly can’t be late! Five minutes is early enough, there will usually be lots of kids attending the casting so the less crowded the better. Be prepared with scripts for acting auditions and be sure to practice prior to the casting and again in the car on the way there. One of the other things I love the kids to do is to introduce themselves. 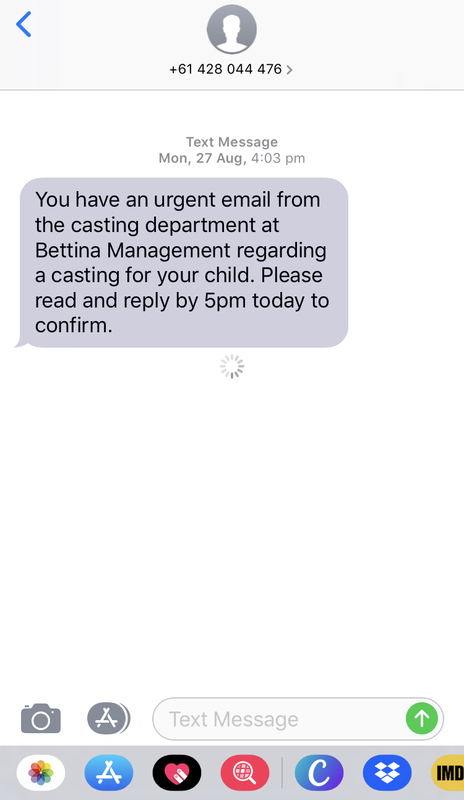 A simple ‘Hello, my name is _____ and I’m from Bettina Management’ again demonstrates a high level of confidence with just a simple sentence. It is also really nice to thank the casting directors when you leave, try to remember to call them by their name (especially for the older kids). Also bear in mind, your presence at a casting will reflect on us as an agency and we have a lot of trust in our talent to help us maintain our strong ties with our clients. 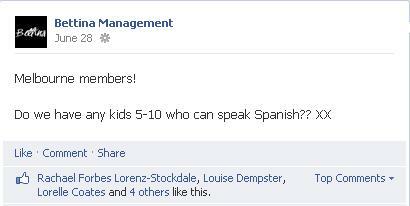 If you have any questions at all pertaining to a casting, we are always happy to help. Remember, preparation and punctuality is key! Once the excitement of the casting is over, a waiting period will commence. Patience is a virtue – that we need to have too! Clients can sometimes take days or weeks to call back to select the children they would like to use, or sometimes they simply call back straight after the casting. Unfortunately there are no designated time frames where we can say ‘it always takes 3 days’ or ‘you will definitely hear tomorrow’, because all production companies and clients have their own time schedule to work towards, and these vary. Some are pressed for time to meet deadlines, whilst others are planning well in advance. However, there are times when a client will let us know when the shoot is scheduled for, and in these cases we have a rough idea as to when we would be expecting a call. Especially if we have had to check your availability for shoot dates prior to attending the casting! Remember, we will only be in contact if your child is selected to proceed to a callback or booking. Unfortunately, no news is not good news in this industry. Castings are an ongoing process, and we often have up to 20 campaigns on the go at any one time, we have many children attending castings and unfortunately we do not physically have the manpower in the office to call each and every parent to let them know that their child was not successful. Also, in light of the above detailed ‘waiting’ period – we do not jump the gun if we haven’t heard back from the client in a week and assume that your child hasn’t been selected, so we don’t call to tell you ‘we still haven’t heard anything yet.’ Rest assured, if your child is selected you will be the first to know! Don’t be disheartened, not everyone can get the job! That’s the whole point of a casting – to meet everyone in person and assess who would be the best fit for the product or campaign. There is a lot more that goes into it than what meets the eye! Attending a casting or audition will help you to gain practice and an understanding of how everything works while building on your experience. Congratulations! Whether it be your first job or your seventh, that rush of excitement is still the same. Be proud of yourself! You must have impressed the client on the day and can now relax and look forward to being featured in a catalogue or commercial – and get paid for it! The booking process will begin as soon as we have the confirmed date of the shoot. Depending on which state you live in and what age your child is, will depend on the relevant forms you will need to fill out. The day before a shoot we receive a ‘call sheet’ which will outline the times and location for the following day. More often than not, this will arrive in our inbox closer to the end of the day than the start! We do contact you as soon as we have the information, we will never purposely keep you in the dark with information you need to know so hang in there! And when all the hard work is over….? Just a quick post to remind everyone the reasons that we post status updates requesting non-members for castings in what we call an ‘open casting call’. The main purpose of an open casting call on Facebook is to reach an audience of talent that we do not already represent. Sometimes we receive briefs from clients that request ages and categories that we can not fulfill from our talent pool such as parents, grandparents and newborn babies (we represent talent from 5 months of age). We find that Facebook is a great way to meet our client’s needs while also giving someone an exciting opportunity. 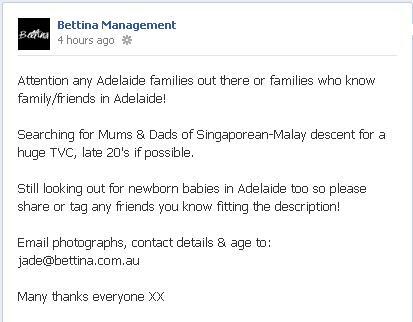 So from this instance, you can see that not only are we looking for talent in a state where we do not represent any talent; Adelaide, but we are also needing newborns AND parents. Another situation where we would post a request on Facebook is if we are after a very particular and specific skill or ability which is not stated on any current members’ profiles, or only on a few profiles and we want to ensure no-one misses out if they newly have the skill or failed to list it. It’s 4pm on a Monday, you’ve just received a call that your child has been requested for your first casting….and it’s tomorrow, at 10am! The excitement over receiving that first casting, the call you’ve been waiting for, is overcome by a sudden wave of nerves. What do I need to wear? What should I expect? ? How many other children will be there? Let’s overcome some of the most common questions about heading to a casting so that you and child both can waltz in at ease and with confidence. What do I dress my child in? If it is for a photographic shoot, think about the company you are going to the casting for. Is it Target or is it Witchery Junior? Have a look at the website and at the clothes they are advertising, think about what would be appropriate for the brand, so don’t go to a Target casting in a gorgeous shiny dress but instead opt for something cute & casual like jeans and a jacket. Vice versa for other brands – don’t go to a Witchery Junior casting wearing tracksuit pants or runners (probably goes without saying but you never know!) If it’s a casting for a TV commercial; cute, bright and neat clothes are a must. Make sure shoes are clean! Sometimes it’s the little things that make the biggest impression. What will happen once I get there? Always try and arrive early enough to be able to find a car park! About 5-10 minutes before your appointment time go into the office or building, make yourself known to the receptionist and take a seat and wait to be called. 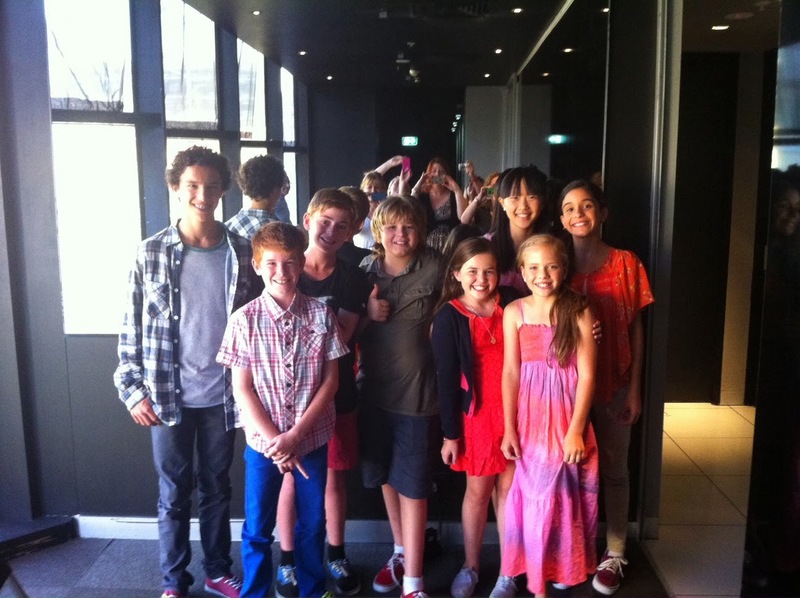 All casting directors meet with children on a regular basis so the atmosphere will be welcoming. Most casting directors are usually working to a deadline and can be very pressed for time – if you are rushed, do not take this personally! It’s part of their job to get through things quickly. Depending on the role, you could be there for only 5 minutes to have a quick chat and photo taken – or you could be there for 10-15 minutes if there were lines to be learned prior to the casting. At about 7 years of age, try and let your child go into the room alone. This will demonstrate independence and a willingness to engage with new people, obviously don’t force this upon your child should he/she be feeling nervous (especially if it is the first one)! Do we get paid to go to the casting? No. A casting is like a job interview, the client will need to meet and assess talent before making any decisions! Similar to when you came in to Bettina Management for an interview. When do we find out if we were successful? Do we get a call? The successful child/ren can be chosen at any time – just as you are waiting for a call with news, we are too! It is not common practice to call each and every child after they go in for a casting to let them know they haven’t been selected. If you haven’t heard anything in 3-4 days, give us a call to double check. We can let you know if we’ve received a response yet or not! Successful talent will be notified as soon as we receive the news, first point of contact is calling Mum or Dad’s mobile (whoever answers first! ), so make sure you keep your phone on you in the days following the casting. The booking of a job can also happen quite quickly, or your child may be requested to go in for a fitting or a callback (which you do get paid for)! Is there anything else that stresses you out about going to a casting? Does anyone have any funny stories from their first casting?